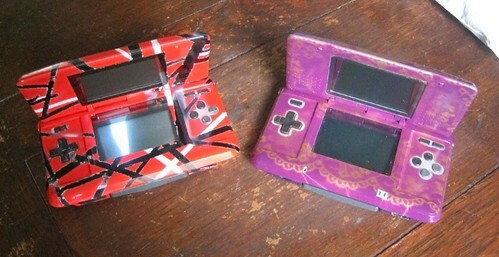 Two Custom DS's, originally uploaded by Mr Atrocity. Tinseltroos and I have just had our first full weekend of the year and we've used a sizable part of it customising our Nintendo DS's. I'll bet you can't guess whose is whose? Such a fun mini-project and we also finally got to the end of Season One of Battlestar Galactica. Suffice to say we'll be rushing out tomorrow lunchtime to try and get Season Two. I forget the last TV series I got addicted to but this one has me by the short and curlies. Now we're both scouting about for things to customise. If anything stays still for too long it may end up getting painted. Stay tuned. Update: DS Fanboy has picked up our efforts. Tee hee, notoriety at last. Updated update: And the only person to leave a comment there says it's rubbish. Ha ha, oh well, I suppose not everyone shares my love of 80's hair band aesthetics. How cool. A friend of mine was just raving about BSG to me on Saturday night. Apparently, I don't know what I'm missing. Well if you want to test the BSG waters before diving in, the series starts with a mini-series that's collected on a single DVD and is three hours long. Give that a spin before comitting to the full blown experience. Mr Atrocity is a largish furry omnivore most often found in an urban environment. 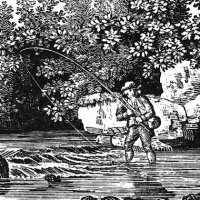 Sightings confirm a preference for tweed and tea. He is easily lured into traps baited with a well placed cup of Assam and a slice of ginger cake. Hunters have exploited this weakness to the point where he is on the verge of extinction.